Notice: This service is no longer available. BDO Mobile Banking allows instant access to own BDO deposit accounts (Checking and Savings Account) using a SMART or Talk ‘N Text mobile phone. 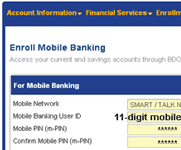 It can be used to view the actual balance of enrolled Checking or Savings Account (CA/SA), transfer money to own enrolled BDO bank accounts, reload prepaid (SMART, Talk ‘N Text, Globe and TM) and reload SMART Money Card (for SMART and selected Talk ‘N Text mobile phones). 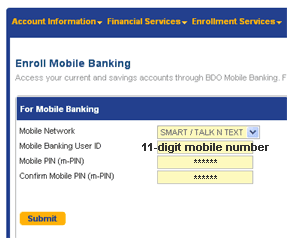 Here’s how to setup and use BDO Mobile Banking on your Smart cellphone. A. Enroll in BDO Internet Banking. A Checking or Savings Account must be first enrolled in BDO Internet Banking. Enter the amount to be transferred, press OK. Use either # or * if decimal point is not available. BDO to Smart Money Transfer. No transaction fees. Smart Money to BDO Transfer. This doesn’t work. For more information, visit BDO Mobile Banking. what to do if error in plugin data in smart mobile banking? ask ko lng po mababawi ko pa po ba ung pera na pinadala sa smart money na pambayad ko po sa order ko na cellphone dhil sa olx kso hnd po naibigay ung cellphone ng taong ka transaction ko na nag post sa olx po pero hnd ko pa naibigay sa knya ung reference number na pinagbayaran ko po galing sa bdo po? ano po ba maganda gawin para mabawi ko ung pera na po iyon? How will i change my savings account no. Same lang ba charges pag BPI ginamit for Smart Money? BDO Mobile Banking registration is not working anymore. i have a question. 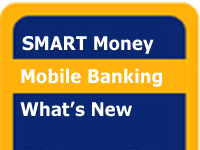 i tried to activate my smart money but there was no option that came out to select the bank which as sampled is BDO. After I put the Wpin, nothing followed and it just sent me a text message w/ the acct number..is it automatically set up with BDO? Do i need to worry?